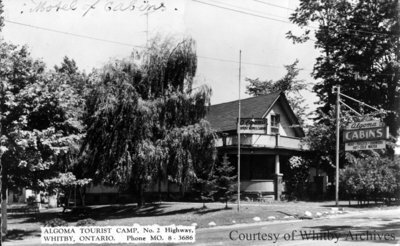 A black and white photographic postcard of the Algoma Tourist Camp located in Whitby, Ontario. In this view a large house and sign for the Algoma Cabins can be seen on the right of the photograph. Algoma Tourist Camp, 1957, Photographer Unknown. Whitby Archives A2014_026_007.